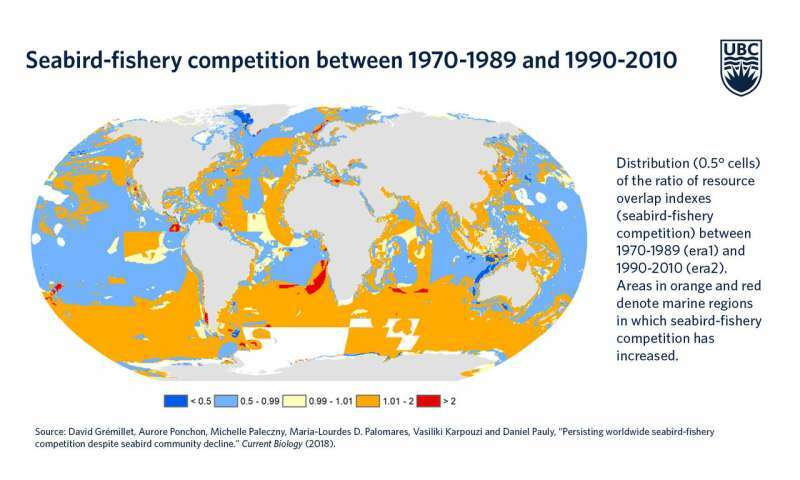 Seabird-fishery competition across the world. Credit: University of British Columbia. This diminished food supply is putting seabirds at risk—making them the most threatened bird group—with a 70 per cent community-level population decline in the past seven decades. 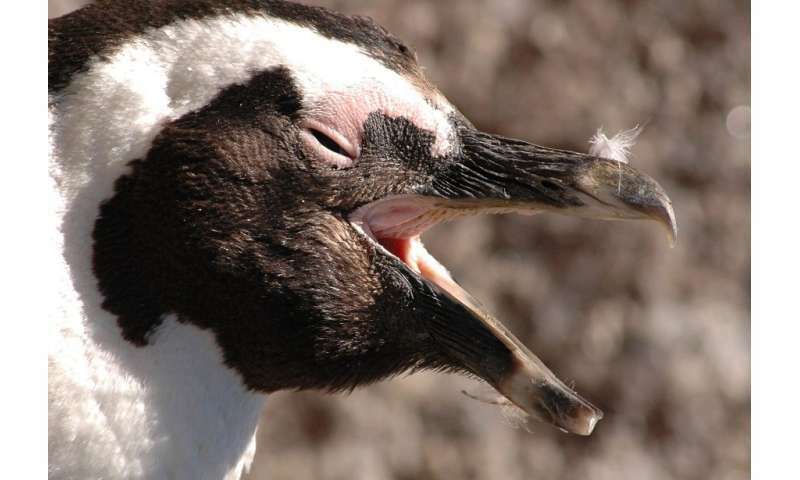 African penguins are facing extinction. Credit: David Grémillet. The researchers mapped where seabirds caught their prey, calculated how much and what they consume based on what is known about their diets and caloric intake, and compared that information against the Sea Around Us initiative's global maps of fisheries catches of species targeted by both seabirds and fishing boats. "In total, we analysed the behaviour of one billion individual seabirds across four decades, which is about 60 per cent of the world's seabird population," said Deng Palomares, co-author of the study and the Sea Around Us project manager at the University of British Columbia's Institute for the Oceans and Fisheries. "Those that feed on squid, Antarctic krill and small 'mid-water' fish such as herrings and sardines are suffering the most." Palomares explained that urgent action is needed because not only are seabirds starving to death as they engage in unfair competition for food with massive vessels, but they are also getting tangled in fishing gears and on the large amounts of plastic waste floating on the world's oceans. "On top of this, they are threatened by oil pollution, the introduction of non-native predators to their colonies, the destruction and changes to their habitats by human activity and environmental and ecological changes caused by climate change. If we don't do anything, seabird populations are going to collapse," the Sea Around Us researcher said. More information: The paper "Persisting worldwide seabird-fishery competition despite seabird community decline" was published today in Current Biology. ...so people should go hungry instead? Make the ecosystem argument on how the fish need the birds so we can harvest the fish. Clearly please. I'm still not getting why when they go about this and that being damaged, no one explains what the damage is. Ecosystem changes are irrelevant unless they result in us not getting what we want. Acting like anything but our opinion matters here is asinine. There are no other opinions. The ecosystem does not care about you as it is not capable of being conscious. Screwing the fish and the birds in the short term could lead to disaster in the long term. It's because we are not living renewably. We are using up resources MUCH faster than they can replenish. Ecosystem changes are irrelevant unless they result in us not getting what we want. Gosh, how selfish and short sighted. F*ing up the ecosystem will always result in us not getting what we want. First it costs money, then it costs food, then the lynch mobs come out of the cities. Better hold onto them guns, you might get a few before they string you up. The solution: harvest sea birds for food. Turn them into surimi. Nobody will know the difference. Or reduce the growth rate of human populations. Drastically. This is the only real solution for most of the problems that currently plague us. The Da Snob jackass brays again. This is the jackass who boasted about his meat eating habit and further proclaimed that he had no intention of changing. And, he did this when commenting on a study that showed the meat industry was one of the biggest GHGs emitters. Better bray like a jackass at the heretics. That'll will save the world. Seabirds transport nitrogen from regions that are nitrogen-rich (feeding grounds) to regions that are not (flyover paths). Google up "seabird nitrogen transport" and you'll see some utility. Clear enough? The ecosystem is conscious, BongStar420. I'm a part of it, and I'm conscious (I suppose here that you mean self-aware). I'm pretty sure whales are conscious. I'm pretty sure that elephants and orangutans and apes are conscious. I don't think that consciousness or its opinions have anything to do with the justification that you demand regarding the utility of seabirds to man: that's just muddled thinking, conflating the importance of consciousness with utility to a species. More directly, I think your demand for an argument of how seabirds contribute to fish harvests is myopic, at best. Ecosystem relations are generally more complicated than that. Your oversimplification is likely to disqualify relationships that have important economic consequences.